Barton Creek Resort & Spa sets the standard of excellence and beauty for Texas golf, with the # 1 and # 2 rated courses in all of Texas. The four exquisitely manicured championship courses that highlight this property are designed by Tom Fazio, Arnold Palmer and Ben Crenshaw on the unique Hill Country terrain in Austin. Guests of this luxurious resort can also enjoy instruction on one of the nation's top golf vacation schools - the Barton Creek Golf Academy, with group classes and private lessons available. The resort offers unmatched beauty and luxury in a variety of accommodations, with amenities worthy of a world-class property. Guests can enjoy a full service spa, indoor and outdoor pools, fitness center, tennis, a kids club, ample meeting/conference facilities, plus a variety of casual and fine dining options - all in a luxurious setting on 4000 secluded acres of rolling hills. . For more info, visit our page for the resort, with direct link to their website by clicking here. The Fazio Foothills and Crenshaw Cliffside courses are on resort property; the Fazio Canyons is a few miles away and the Lakeside Course is located About � hour from the resort. Each course has its own clubhouse and practice facility. Uniquely - each of the four courses provide pin placement sheets on all carts, indicating the distance the hole is located from the center of the green. 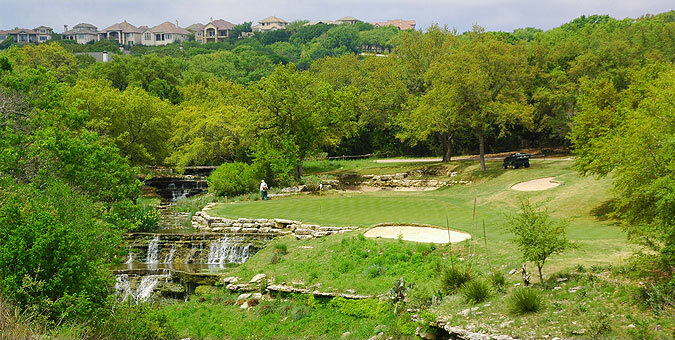 This course is the original layout at Barton Creek, and since its opening in 1986, has consistently been ranked among the top courses in the state. It was also honored as the Best Resort Course in Texas by the Dallas Morning News (which also named 6 of its holes as among the most beautiful 18 holes in the state), and was named as the # 1 course in Texas (with the Canyon Course at Barton Creek listed as #2) by Travel & Leisure Golf Magazine! The course is both challenging to the avid golfers, yet rewarding to beginners and high handicappers, and features spectacular vistas of the surrounding Hill Country. There are approximately 64 soft sand bunkers - some quite long and sprawling, and water comes into play in the form of ponds or creeks, on 8 of the holes - with some spectacular landscaping that creates awesome visual effects. This course is simply BEAUTIFUL! There are some significantly elevated tees, and all the fairways though providing ample landing zones, are challengingly tree lined. There are 5 sets of tees that play to distances and slopes measuring 7125 yards/135 slope, 6684 yards/132 slope, 6270 yards/127 slope, 5900 yards/124 slope for men and 127 for women, and 5185 yards with a slope of 115 from the forward tees. On course yardage blocks are posted at 100, 150 and 200 yards (and 250 on par fives) and sprinkler heads are measured to the center of the green on all par fours and fives. All par threes also have posted yardages at each tee area. Color coded flags on the greens indicate front, middle or back hole locations. From the opening holes golfers will be treated to an outstanding golf environment. The par three 3rd plays over a deep gorge, and number 9 is also a challenging three par can make or break the front nine. This hole plays over a cascading stream that also runs the length of the spectacular par five eighth. There is a rock-walled bunker resting behind the multi-tiered ninth green, creating a memorable backdrop. The back side is equally outstanding, and golfers will leave with a wonderful impression, as holes 16 through 18 make up one of the most beautiful closing stretches we have witnessed in all our travels. With spectacular views of the resort, the par 5, 18th hole plays from elevated tees into a valley with water on the left. It doglegs slightly right to a severely elevated green that is protected by sand, a rushing stream, and a rock wall. This is a very tough finishing hole. Manicured conditioning, varied and interesting hole designs, memorable shot values - and this course is situated right on resort property! Warm up on the wonderful practice facility, and be prepared to play your best. This is a layout that is a destination unto itself - A MUST PLAY! We cannot say enough to do this course justice. With a first class resort, and four championship courses headlines by the Foothills - Barton Creek receives our highest recommendation. For more information on this course and a link to its website visit our detailed information page by clicking here.